In the morning, gathered around the kitchen table, we began to plan our day. Lancaster, to visit the older sister, was a definite. I would love to spend some time wandering around the countryside, driving too slow behind horses and buggies, picking up some apple butter, photographing the mysterious residents of Amish country, but that would not come to pass. After quite a bit of cajoling, the younger sister agreed to meet us at her dance studio where we would pick her up and take her to Lancaster with us. I wanted to spend some time with her, just to be in her presence, get a sense of her, and this seemed like the perfect opportunity. 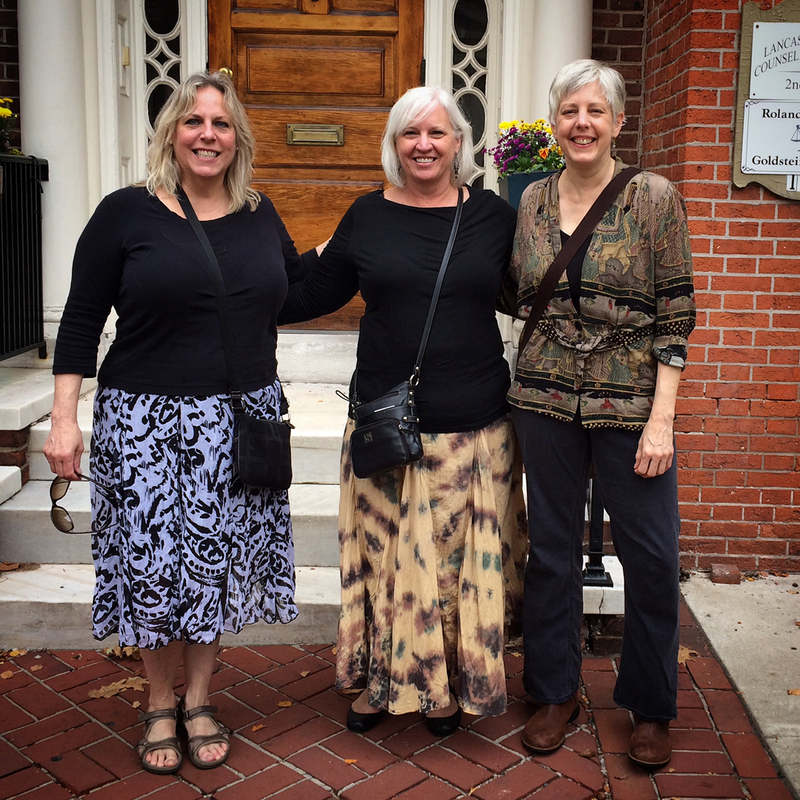 It’s less than an hour’s drive, but our tour of downtown Lancaster, with its one-way streets and inconclusive guidance from both sisters rounded out a full hour. After driving in squares around various blocks trying to find the entry to the one-way street on which her yoga studio was situated, we found a parking space and planted ourselves. I immediately fell in love with this town. Brick, brick and more brick. My sister’s yoga studio is on the third floor of a brick office building. It’s old, so much older than anything in Florida. The stairway is narrow, with steps and railings that creak, the halls are covered in aging wall paper and the windows are thicker at the bottom than the top, having settled in the sun over the years. It’s perfect. The studio itself has wood floors, a few window nooks and a fireplace. It’s homey and clean. There are no Buddha’s or Oms or other accoutremant that would lead someone to believe this was a yoga studio except for one wall of mats, blocks and straps. And perhaps the lack of furniture. She has recently been led to read the Bible and give up her Buddhas; and along with it the practice of Buddhism that guided her for many years. Which is why I am here. Well, the pretense under which I planned the trip. We decide on an Indian restaurant within walking distance for lunch. The four of us are at varying degrees of hunger so the buffet suits us. It is here we can actually hold a conversation, maybe relax a little, reveal a bit of ourselves to each other. There is a definite connection between the two of them, although there is also some sort of buffer or reserve. We talk about safe things, our yoga studios, my road trip so far and where we’ll go next. But it is enough. There is fifty years of unspoken and misunderstood, and largely misinterpreted – by all of us – history between us. We all need forgiveness and to forgive, it’s just unclear how that is to happen. So we have this; light conversation and companionable silence. After lunch we walk back to the yoga studio. It has started to rain. I am handed a box full of Buddhas, including the one I purchased from her. She is letting go of it all. When she decided to let go of and sell some of her beloved Buddha’s she thought to message me about them. That says a lot. I purchased one, but there was another I truly loved that was just too expensive. She gifted it to Larry and I as a wedding present. That we are all here together, sharing more than our DNA speaks volumes to me. Whatever it is, this relationship, is perfect. I’m glad we did this. If I hadn’t taken this road trip I don’t know if I would have ever seen any of these people again. They’re content. My older sister lived in Holland for many years and misses it but probably won’t ever go back. The younger one lived in south Florida for a while to go to film school but she’s back in Pennsylvania now. This is their home. I know it is up to me to continue the relationships, I am the outsider. But now that I have done it, made the trip, taken the leap, I’ll gladly do it again.